For February 2007, the average listed rent price of all listed rentals in these areas was $2,016.24, representing a 1.0% increase over two months ago. This was a general price increase across all rental types, with about 25% of listings in the West Los Angeles -- South region being houses, duplexes, or triplexes, as opposed to apartments, condos, or townhouses. This ratio of houses to apartments was relatively unchanged over two months ago, when approximately 20% of listings in these areas were listed as houses, etc. There was almost no change in the size of the listed rentals, as measured by the number of bedrooms. About 49% of the rentals listed in the West Los Angeles -- South region have two or more bedrooms, with the rest being studios, singles, and one bedrooms. This has changed little in the last two months, when that percentage was about 50%. The largest rent increases occurred in Marina Del Rey, where the total increase was 33.6% and Westchester, where the total increase was 16.6%. 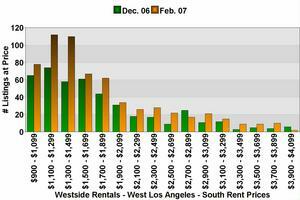 Rent prices also increased in Mar Vista (up 9.7%). Rent prices decreased in Venice by 14.4% and Playa Del Rey by 8.7%. Rent prices were also down in Palms (down 7.7%), Culver City (down 2.8%), and Playa Vista (down 1.8%).